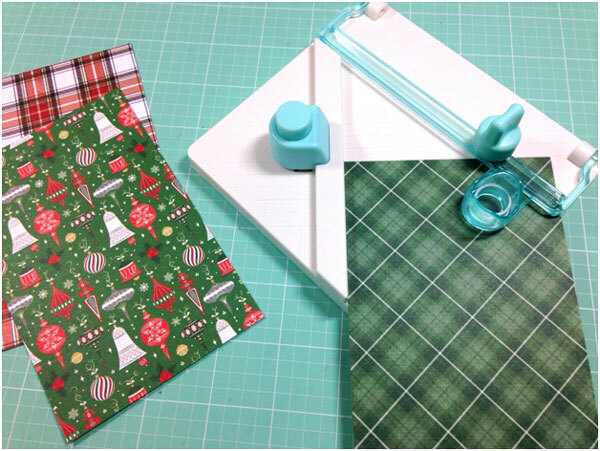 This holiday season, you’ll need lots of ways to decorate packages and bags. Tags are one of my favorite things to make and I make a lot of them! 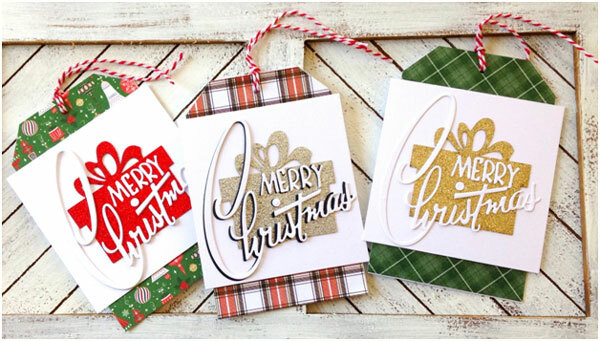 For my project today, I’m creating some easy tag embellishments with ready-made die cuts and a fun, retro-style sentiment. 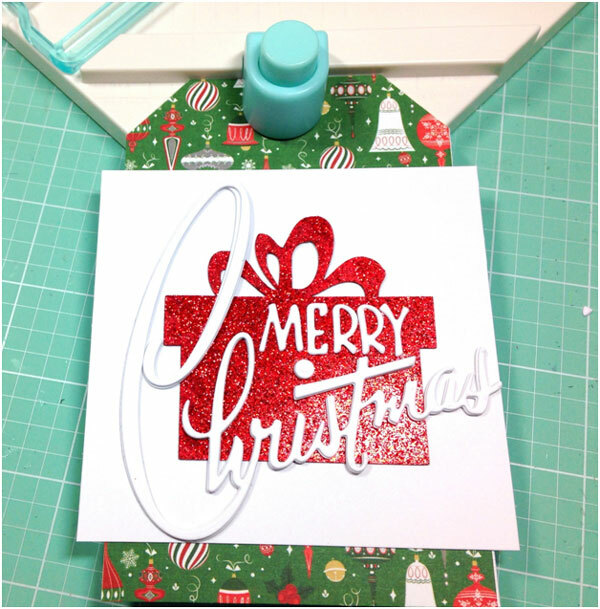 For my main tag base, I’m covering a cardstock tag I made with the WRMK Tag Punch Board with some Here Comes Santa Paper from Photoplay. 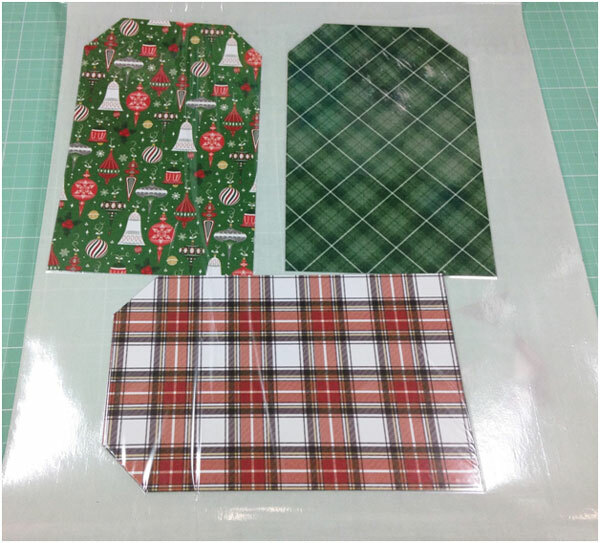 It has some great plaid patterns in the pack that are so festive! 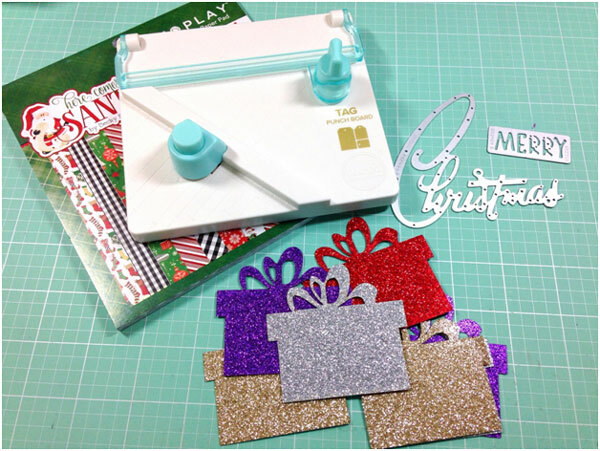 I’m also using the Sizzix Thinlits Retro Merry Christmas die from Tim Holtz along with some Paper Accents Glitter Shapes Presents die cuts. 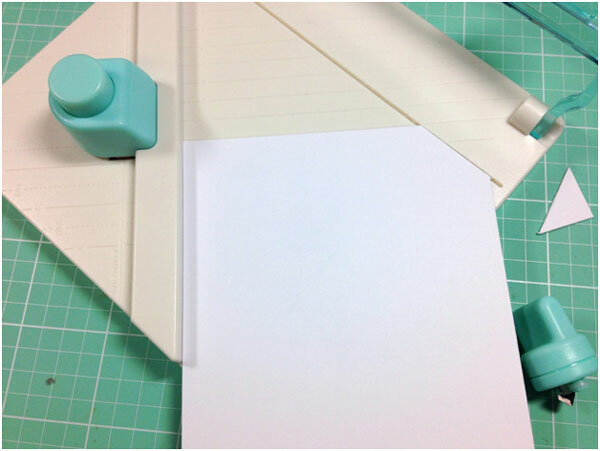 To create my tag base, I used a piece of cardstock 3.5”x 5 ½” and lined it up on the “c” line on the tag punch board. Using the little cutter, I trimmed the tag angle on the top right, flipped the tag and trimmed again for the top left. 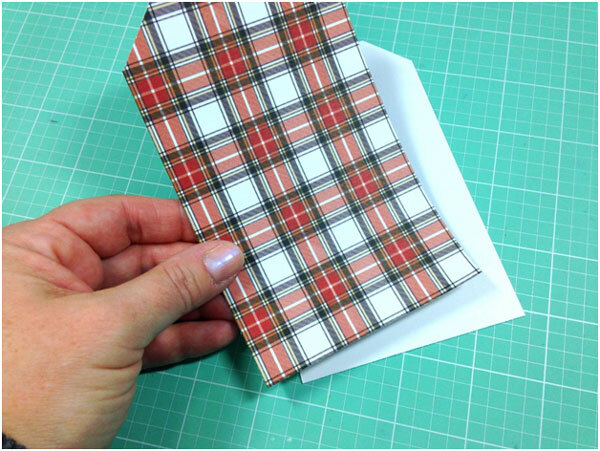 I did the same thing with the patterned paper pieces from the paper pad. 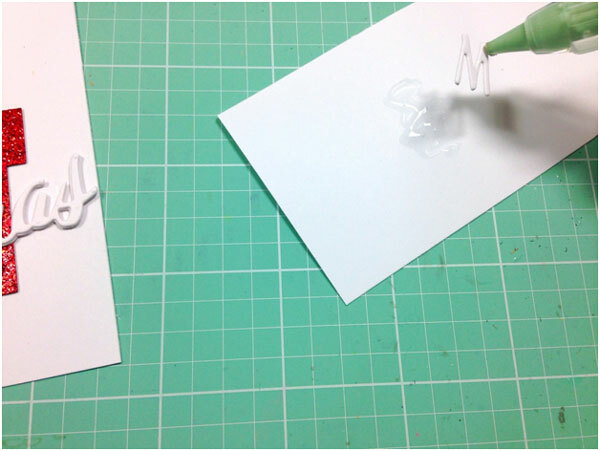 I ran the patterned paper tags through my Creative Station adhesive machine to make sure I had adhesive from end to end. This prevents any peeling up of the paper and makes a nice, sturdy tag. I then adhered the pieces over the top of the white tags. Next, I created my top panels by adhering a die cut gift onto a white cardstock panel 4”x 3 7/8” and layering the Merry Christmas die on top. 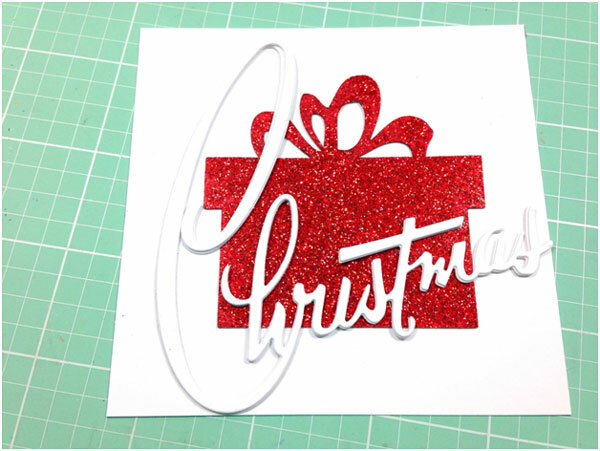 I die cut 3 of the Merry Christmas dies with white cardstock and adhered those together with my Zig 2-Way Glue Pen. This layering gives the word dies a little more dimension. 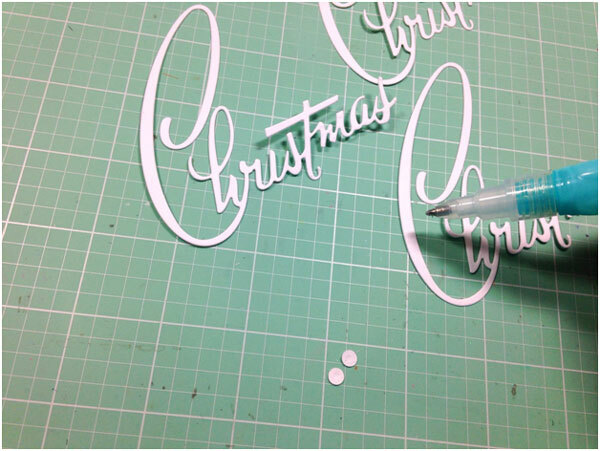 To glue the tiny “merry” die cut, I squeezed some Tombow Liquid Aqua glue on some cardstock and ran each letter over the top using a pick up tool. To finish the tags, I adhered each panel over one of the large tags using my Glue Glider Pro, punched a hole in the top using the tag punch board, and added some red and white twine. 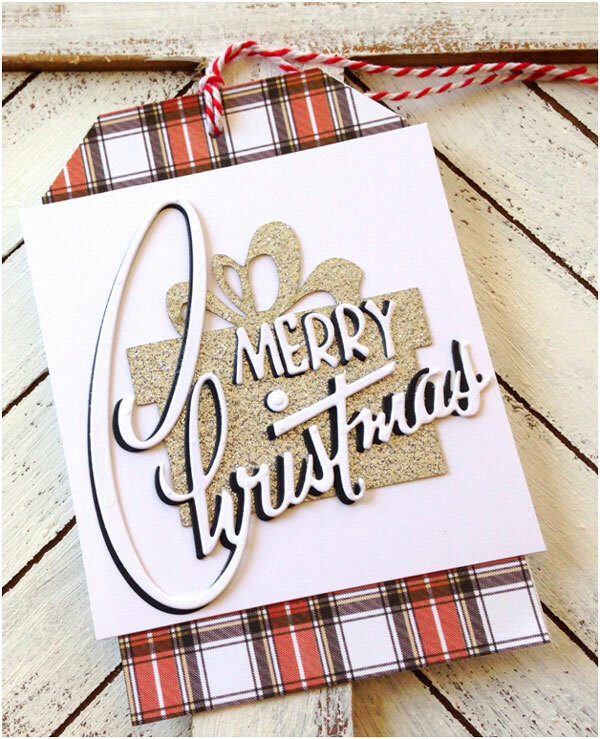 I love the raised look of the Merry Christmas and that big, bold retro writing is so fun! For this tag, I die cut the words in black and layered them behind the white for a shadowed effect. These tags are easy and fun to make. You can set everything up assembly line style and have plenty on hand for all those holiday packages. Thanks so much for joining me today! 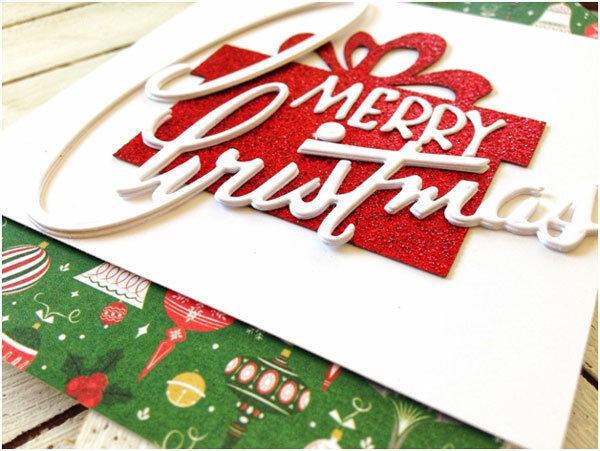 This entry was posted in Christmas, Paper Crafts and tagged Christmas, Die Cutting, Gift Tags, Holidays, Punch Board on November 25, 2018 by Heidi.